Liverpool may have become the first team this season to have prevented champions Manchester City from scoring, while also maintaining their own unbeaten run in the Premier League, but their goalless draw against Pep Guardiola’s side has thrown up more questions than answers. Instead of satisfaction over the increased solidity of the Reds under Jurgen Klopp, the general feeling emanating from Anfield, with the game having come four days after a disappointing 1-0 defeat in Naples, is one of concern. Whereas last season, every positive result was followed by a firm “yeah, but…” followed by a recital of familiar issues at the back, the complete opposite is emerging of Liverpool in 2018/19 as while Joe Gomez, Virgil van Dijk, the recalled Dejan Lovren and Andy Robertson largely excelled, it was another game without a goal for Mohamed Salah, Roberto Firmino and Sadio Mane. At least, unlike at the Stadio San Paolo, there were shots on target – two, to be precise – but a team that was so exhilarating and dynamic in attack is looking increasingly passive, either starved of space, service or both. Our friends at Football Whispers take a look at the Liverpool midfield and where the problems lie for Klopp in trying to fire-up his attack. The Reds averaged 12.9 key passes last term and are at 10.4 this season, while they’re fashioning 1.75 big chances per game against 2.05 in 2017/18. That’s represented in the slight dip in overall shot numbers from 16.8 to 14.4 (although their xG per game has actually marginally improved from 2.03 to 2.08). Small differences though they may be, but differences all the same and enough to maybe turn a 0-1 in Naples into a 1-1 or a 0-0 at home into a 1-1. There’s no denying Salah, Firmino and Mane are yet to hit anywhere near top form but it’s notable that among their midfielders, Liverpool have just one player in the top 50 for total open play chances created, James Milner at 47th with 4.0 and expected assists per 90, again Milner in 18th with 0.2. Last season, in terms of total open play chances created, Liverpool had five by the close of the season – Alex Oxlade-Chamberlain (26th), Coutinho (who only played half a season, 27th), Milner (33rd), Henderson (34th) and Georginio Wijnaldum (44th). Of course, Oxlade-Chamberlain is a long-term injury absentee and Coutinho is no longer with the club but the other three formed Klopp’s starting midfield on Sunday yet all are producing almost 50 per cent of their open play key passes per 90: Milner 0.61 against 1.17, Henderson 0.43 and 0.95 and Wijnaldum 0.38 and 0.75. That’s an alarming drop-off and emphasises just how fewer opportunities are being provided to the front three, forcing them to do their own work and, as a result, potentially affect their chances of scoring. It also showcases the need for greater playmaking in the Reds midfield which is, in part, why Naby Keita was brought to the club. Not necessarily as a pass-heavy No10 but an individual who can provide the link between the centre of the field and the final third. 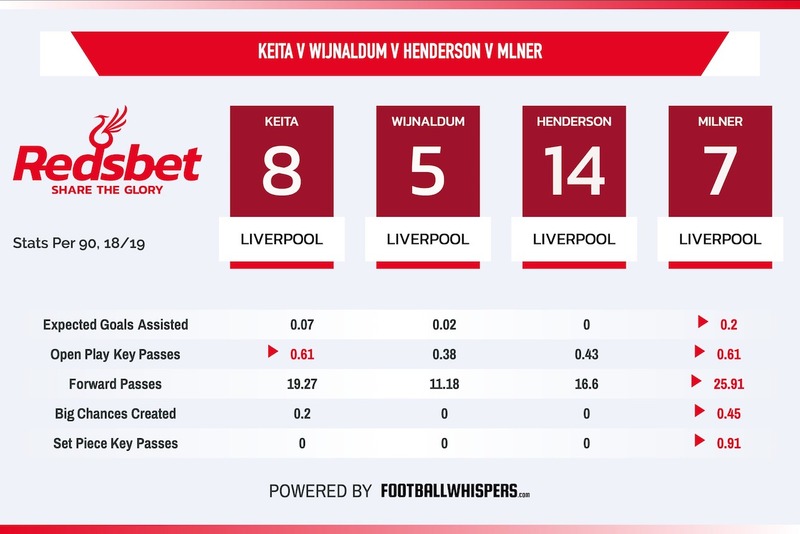 After a bright start, however, Keita’s performances have dipped and although he’s still producing decent numbers for open play key passes (0.61, 25th) and xA per 90 (0.07, 23rd), he hasn’t become that box-to-box midfield titan Klopp envisaged. On the bench, the Liverpool manager had a natural playmaker in Xherdan Shaqiri but the Swiss didn’t get on the field. Based on his six appearances, his place is seen in the attack rather than as part of the midfield, for reasons, it would seem, of defensive security. As Stoke fans will attest to, Shaqiri’s desire to track back or follow runners aren’t among his best attributes. Adam Lallana also returned to full fitness last week and although he was not deemed ready for the City game he’ll be back in the squad picture after the international break. But again, it’s difficult to see where he fits into the midfield three with a more obvious place on the flank instead of Mane or Salah. The summer arrivals of Keita and Fabinho, who has played 102 minutes so far, was supposed to herald a greater flexibility in Liverpool’s approach but so far they’ve remained rooted to Klopp’s tried-and-tested 4-3-3 with Salah, Firmino and Mane seemingly immovable. Added to that is this greater emphasis placed on defence. But welcome as that may be, and we are still in the very early days of the evolution of the team this season, eventually a better balance will have to be struck to bring out the best in the front three and Liverpool as a team.